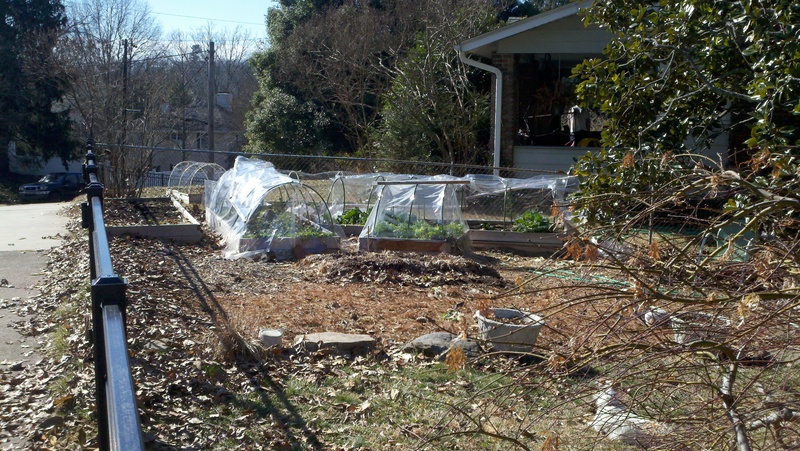 I’m in the beginning days of blogging about my garden while we are in the midst of some really cold and gray January days. There’s still spinach, arugula, cress, and dinosaur kale in the garden, but they don’t require much tending right now. I’ve got a couple weeks before I’ll start some seeds indoors — so what better time to write about my garden, before my hands get really dirty and it gets warm and I want to be outside all the time?! Here’s what my garden looks like right now (that’s my neighbors’ front porch in the background, you can see their raised beds too). So my blog at this point is retrospect, a reminder of how I got the raised beds going in the front yard, what we planted and harvested last year. I’m also remembering the quirks and challenges along the way….bugs, borers, wilts – and what I did to try to remedy that.